Forging (Hada) : Hada is moistened fine Itame-hada which is well kneaded and some flowing ware and Mokume burl indication is perceived here and there. Sparkling glitter so called Ji-Nie crystallized mist covers on surface and darkish Nie lines so called Chikei activity gushes out from steel. Temper line (Hamon) : Hamon is fine Konie-based, in which interior is filled with Nioi-mist. Quenching line is straight Suguha where shows somewhat of undulating indication or irregular boundary lines of Gunome or Niju-ha where is covered with fine Ko-nie crystallized stripe. Tang (Nakago) : Nakago is UBU, unaltered original. somewhat shallow slanting left (Asai-Katte-sagari) file marks. The kengyo (V-shape) heel. One Mekugi-ana peg hole. 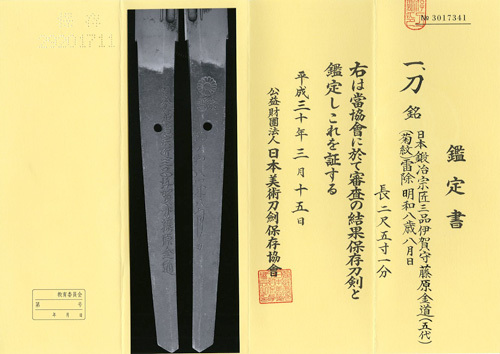 The inscription signature in front starts with a title - Chief Master of Japan Sword Makers - Nihon Kaji Soushou 日本鍛冶宗匠, family name Mishina 三品, an official district title Iga-no-kami 伊賀守, the name of clan Fujiwara 藤原 then smith name KINMICHI 金道. Temper of tip (Boshi) : Temper of tip is straight and medium circle turns back. Mishina-school, the founder of KINMICHI 金道 school, had moved up to Kyoto along with his four sons in Bunroku 2, (1593) from Seki in Mino-province. They were the famed sword smiths so called [Mishina-sword smiths] who are Iganokami KINMICHI 伊賀守金道, Izuminokami KINMICHI 和泉守金道,Tanbanokami YOSHIMICHI 丹波守吉道 and E'chunokami MASATOSHI 越中守正俊. The subject Tachi-shaped katana was made by the 5th generation of Iga-no-kami KINMICHI, real name Mishina Uzen 三品右膳 who obtained Iga-no-kami title in Houreki 3 (1763) when he was 36 years old.His work was very popular to chisel Kaminariyoke (lucky charm - talisman) in the tang below Kikumon chrysanthemum flower crest to keep evil spirits away. Passed away in the 2 nd month Kansei 4 (1792), was 65 years old. The subject sword was made when he was matured 44 years old, while he ardently admired Yamashiro tradition, especially Rai-works from Kamakura period. Among ordinary works, this Tachi-style sword shows his excellent workmanship and would guess that this Katana was exclusively made to be dedicated to Shinto shrine or presented to an honored Samurai class. Good fresh polish/Condition scale: mint - excellent (using a scale of mint-excellent-very good-good-fair-poor).